Outsourcing has the potential to improve your practice’s financial performance in several ways. Many practices experience an increase in revenue when outsourcing their practice or facility billing to FirstStates. In addition to improved revenue, the expense and overhead of maintaining an in-house billing department can be reinvested or recognized as profit. Outsourcing your practice’s medical billing should be a calculated decision supported by financial analysis. How much revenue is not being collected? What is the cost of an in-house billing department? Contact FirstStates for a free practice analysis and we will help determine how much outsourcing will benefit your practice. In many cases in house billing departments can be distracted by office tasks or clinical responsibilities that don’t equate to revenue. Those distractions cause revenue leakage. Today’s healthcare environment places the burden of revenue collection on the provider. High patient out of pocket expenses create challenges for employees to track payment plans or even follow up on outstanding invoices. Insurance companies find any reason to deny claims. Maximizing billing revenue requires employing personnel dedicated to claims denial management and claims appeals. Sometimes submitted claims go unanswered or are “never received” by insurance payors. These unpaid claims go unrecognized until weekly or monthly aging reports are investigated, adding time to the revenue cycle and causing lost revenue. Billing companies tend to pick the “low hanging fruit” but ignore the difficult to recover revenue that ages until it’s written off or sent to a collection agency at a higher fee. FirstStates has the technology and process in place to effectively manage these challenges and positively impact your revenue cycle. The reason for FirstStates’ successes growing practice revenue is due to our dedication to maximizing the revenue cycle. In some instances, FirstStates’ billing fees are often covered by the increase in revenue a practice gains. 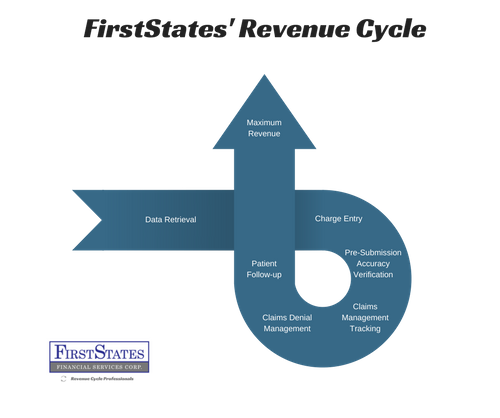 FirstStates performs a free consultation and analysis of your current billing system to identify opportunities for revenue cycle improvement or reduced practice expenses. Billing Solutions are designed independently to meet the needs of each individual practice. FirstStates internal work flow remains constant allowing us to process claims faster and focus on efficiently managing the “lost or misplaced claims” to insurance payors and fight denials on your behalf. We exceed First Pass Resolution Rates of over 98%, reducing Days in Accounts Receivable and increasing cash flow. We encourage providers to use the Electronic Health Record that works best for your practice and FirstStates will provide a secure and seamless method of transferring necessary demographic, insurance and charge information on a daily basis. FirstStates works smarter for you, not harder. Our software reviews encounter data with a series of intelligent rules engines individualized to your practice and its’ payors. This intelligent design allows for work flow efficiencies that add revenue. FirstStates’ team of revenue professionals capture the revenue your current billing solution leaves on the table. Access immediate insight and reporting capabilities through a secure client portal. High powered analytics software allows you to drill down into your practice’s data. Professional staff makes multiple attempts to contact patients who have out of pocket expenses. We treat patients in the manner they would like to be treated. FirstStates maintains updated compliance policies to ensure adherence to HIPAA, CMS, and OIG regulations. Charges are reviewed for accuracy by a certified coder prior to submission. Compliance officers ensure your PHI and billing is handled with integrity.